NOTE: Lonetree Reservoir may be closed to the public in 2018. 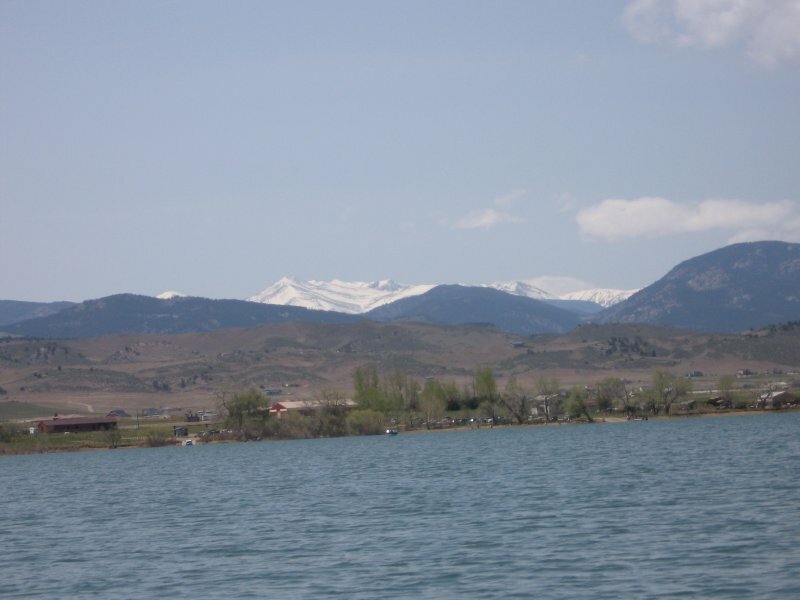 The Colorado Department of Wildlife was outbid for the lease and has already removed most of the fish to other reservoirs. The public may have access, but there may be a fee. 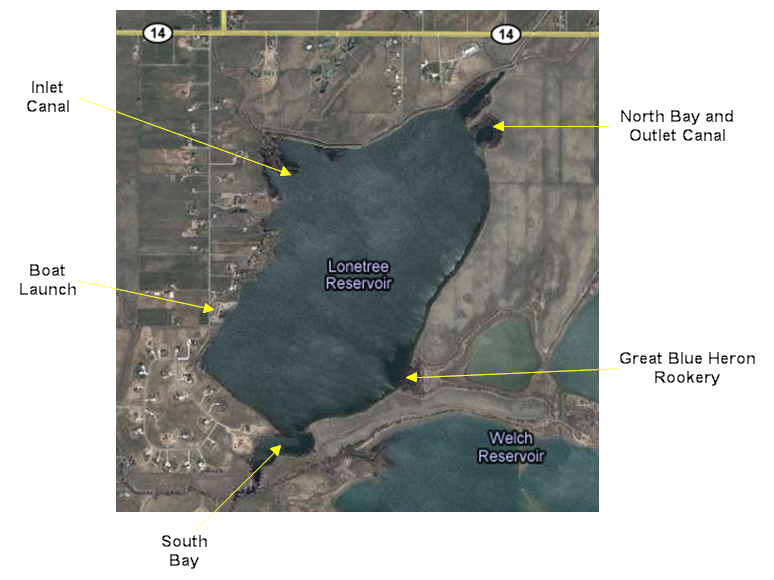 More information is available at this link: Lonetree Reservoir to Close to the Public in 2018. 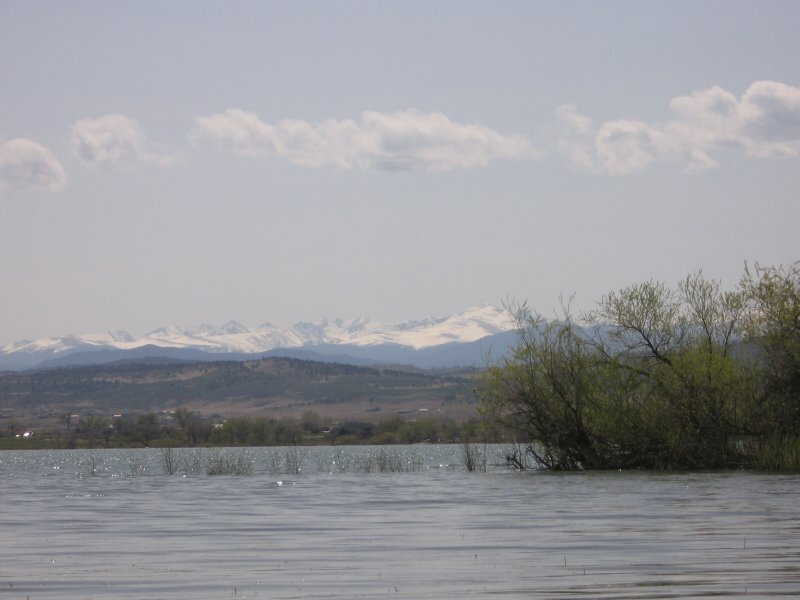 Location: Lonetree is located southwest of Loveland, Colorado. 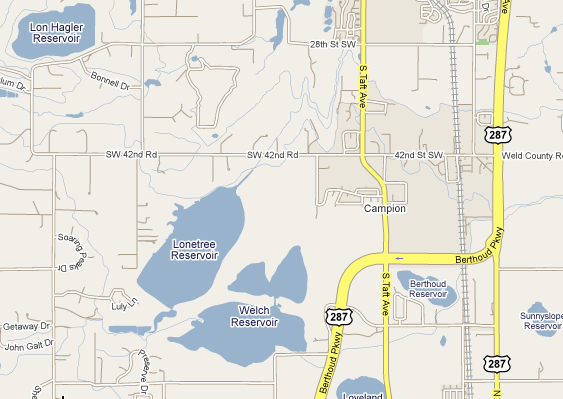 Take 287 or Taft to 42 street SW, go west and turn south on Lone Tree drive. The boat launch is at the end of the road. There are actually two boat launches at the end of the road and we meet at the southern one. The northern boat ramp has a dock and is more for power boats. Lone Tree road ends at the southwest corner of Lonetree Reservoir. Access: The nice thing about Lonetree is you don't have to pay anything. You can just go there and put your boat in the water and paddle. 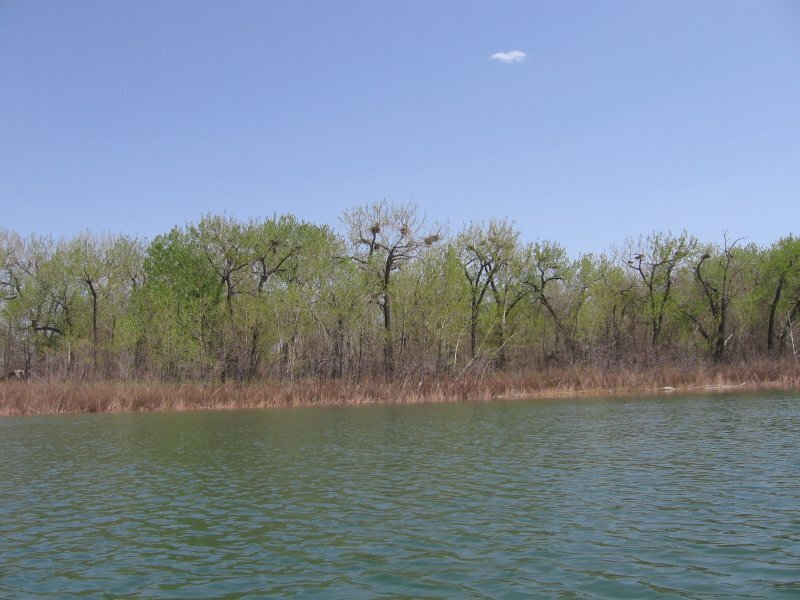 The boat launch and picnic area are on the West side of Lonetree. South Bay: Going right from the boat launch you enter a large bay. In the spring, when the reservoir is full, you can paddle up a small stream. Try to paddle as far as you can. Once, upon just entering this bay, I observed the courtship dance of two Western Grebes. My first thought was, "It looks just like it does in those nature programs on television." 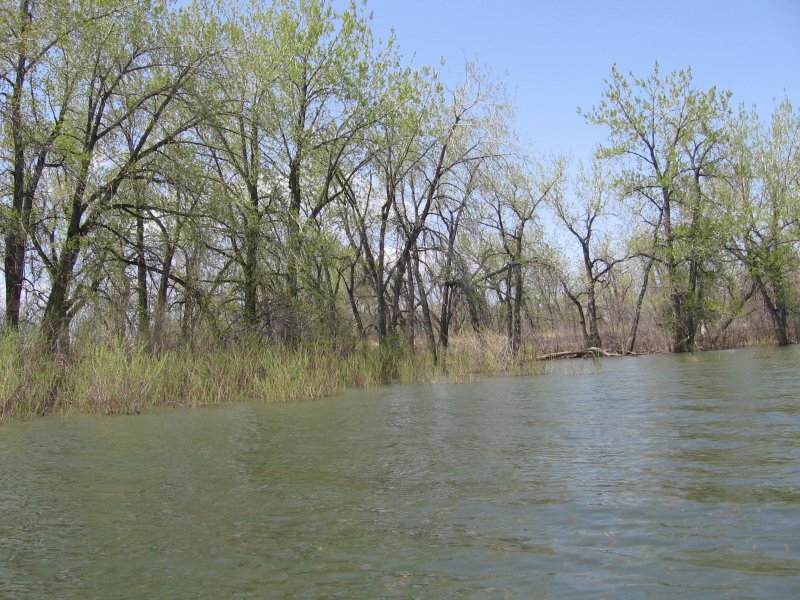 Heron Rookery: The next stop is the Great Blue Heron rookery. You should keep your distance as to not disturb the nesting Herons. The rookery can be a very noisy place in the spring with the young crying for food. North Bay: After a long paddle north, you come to another bay. This bay is very round and has no apparent inlet. We sometimes stop on shore before reaching the bay to have lunch. Outlet Canal: Next to the North Bay is an outlet canal. 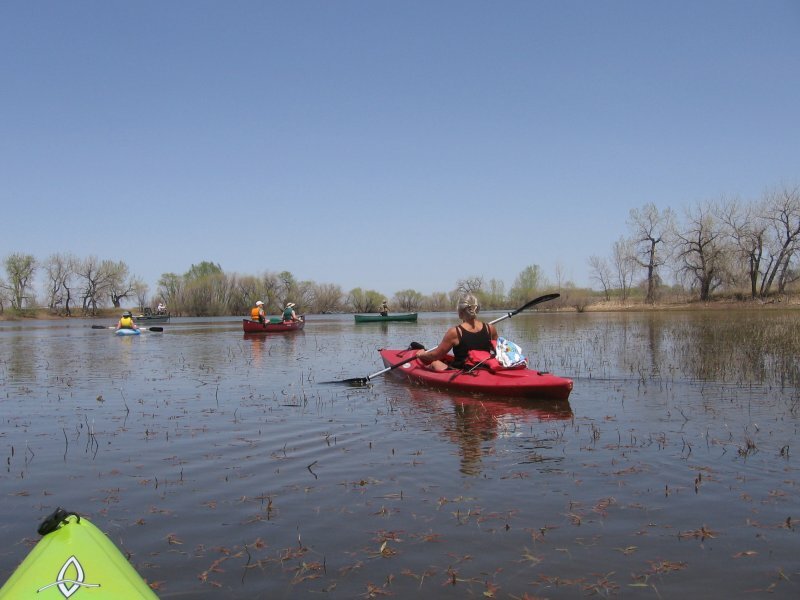 If you paddle to the end, there is a water diversion structure that controls the level of the reservoir. The next picture shows the view from the outlet canal looking west. There is a man-made dam on the north part of the reservoir and another inlet canal enters there. Inlet Canal: The inlet canal is not the easiest thing to find. Follow the northwest shore line and look for a stream running into the reservoir. 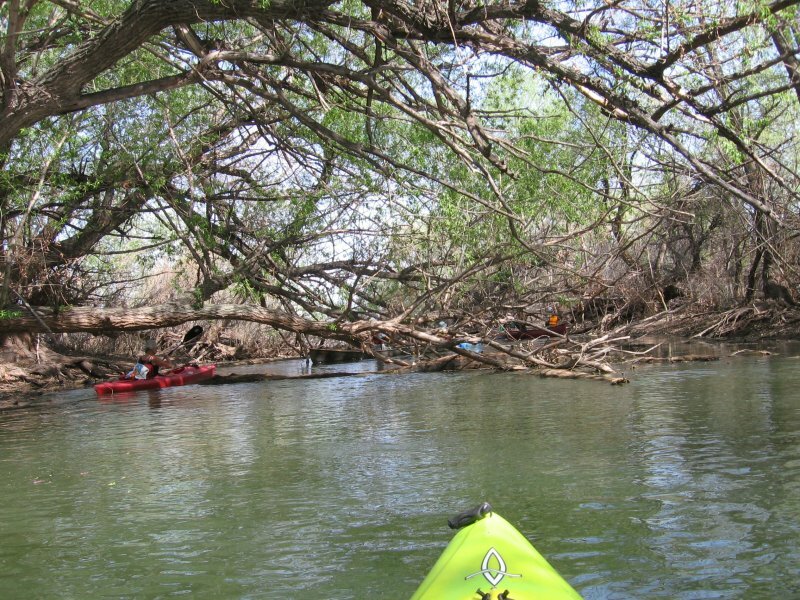 The stream has many fallen trees so paddling it is an adventure. 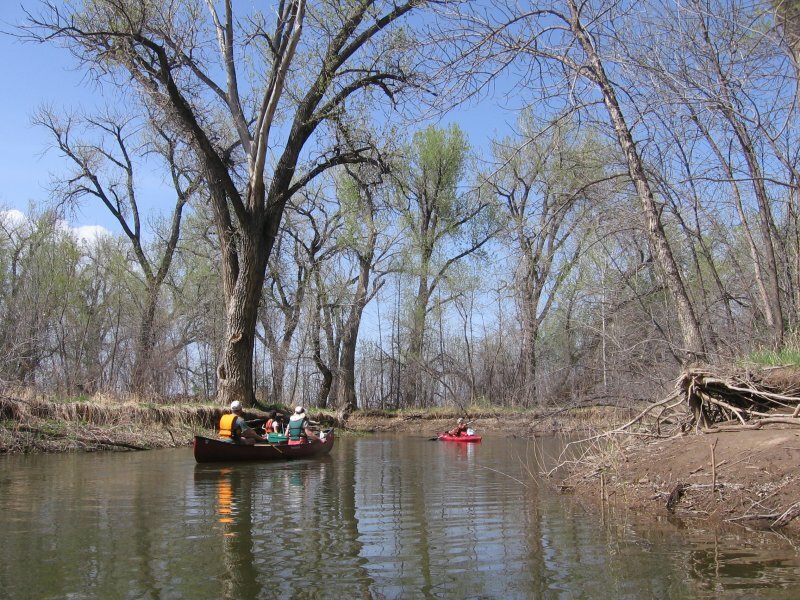 Spring is a good time to paddle Lonetree as the water is usually high. In the fall the duck hunters present a problem as it is unnerving to paddle with shotgun fire coming from the shore.